I wanted to offer an alternative method for setting up tunnels in non-linear dungeons. Consider the illustration on the left, which is similar to the illustration in SubMethod II for the pre-connected method, and which may be used as a substitute if you don't want to use the "clock" method. It's basically an expansion of the d8 variant described in the other post. For this variant, you would check where a door leads by rolling a d10. The rooms numbered 1 through 8 represent directions. Room 9 is the starting point, with one "sample" door in each of the four directions. If, for example, you were checking where a door in the north wall of a room leads, you would roll a d10. Rolling a 1 means that the door leads due north, to Room 1 in the illustration, or in that general direction. You would extend the white corridor stub to the north so that it would connect Room 9 and Room 1. 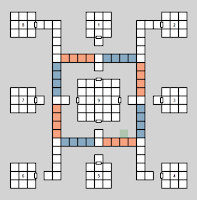 If, instead, you roll a 5, that would indicate that the north door leads south, which would mean the corridor would go around Room 9, and has two possible routes: the red path to the left or the blue path to the right. Flip a coin, or roll a d6: tails or odd numbers means use the left-hand path, heads or even numbers means use the right hand path. If you would like more variety, you can use the coin toss or even/odd roll every time you have a choice between a red path and a blue path, so that a corridor could take either the shortest route or the longest route to reach its destination. In cases where there are three choices (red, white and blue,) any result of 5+ on 1d6 means use the white path, or go straight. So, the route from the north door in Room 9 to Room 1 could be short and straight, or make three left turns or three right turns and spiral around Room 9 on its way to Room 1. Connect the first and second door, making sure to include a ladder or staircase in the opposite direction if the result was 5+. On a result of 0 for the d10 roll, the door goes nowhere: it opens on a blank wall or a short, dead-end tunnel. You can roll a d6 for tunnel length (in squares,) treating a 6 as a length of 0, and rolling another d6 to have the tunnel turn left or right after 2 squares. All of this assumes that you know which walls in your starting room has exits, possibly because you've already rolled some kind of door check (for example, rolling four d8s and reading the result off the d6 table above, with 7+ meaning no door.) 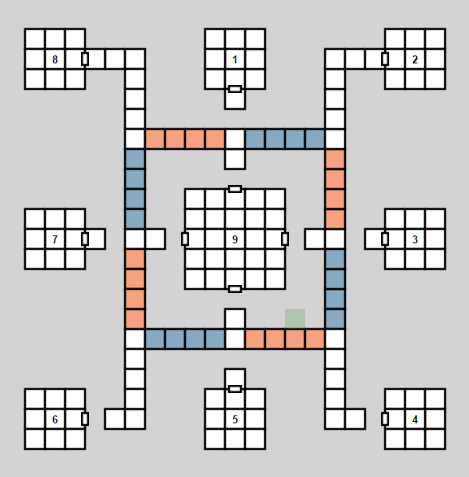 But an alternative approach would be to roll four d10s all at once and reading the result as if you were using a drop-dice table, with the positions of the dice indicating the approximate position of the door, and the result indicating where the door leads. Or make the number of d10s rolled variable by rolling 2d3 first for the number of dice to roll. Once you have your network of corridors leading out of your starting room, you can use the junction table from either SubMethod II or the pre-loaded leximorph method, along with some method of checking every 60 feet of corridor for additional exits, to fill in extra details.